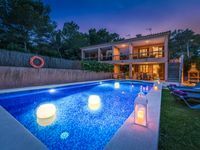 Properties in Urbanització Gotmar average 4.4 out of 5 stars. Modern apartment, cozy, sunny located a few meters from the beach. 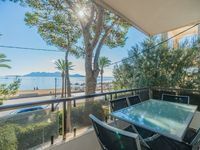 Property 49: Modern apartment, cozy, sunny located a few meters from the beach. We stayed in 2nd half of October 2018. The apartment is clean and well furnished. It has all what we needed for comfort stay--dishes, all kitchen machinery and all. While it was not too spacious for us (two families, 2 and 1 kid, 7 in total) it was generously compensated by it's location and the seaviews. Location: it's just 20 m away from the good, sandy and not very busy section of the beach, but still in a quiet place (which was a nice surprise for us) +bedrooms are located at the back of the building. ACs are in every bedroom. It's close to everything: closest shop is 200m away, farmacy is in 20m, cycle rental (2go Cycling) is 8 minutes walk and water equipment rental (windsurfs, SUP boards etc) is like 3 minutes from the place. Also, you can start a great short hiking trip to Vall De B&ograve;qer (see the brochures in the apt) right from the front door. A crown jewel of the place is to see the sunrise over the bay -- you have an unobstructed (well, two palms at the side) view of the sea and all. The balcony is big enough for 6-7 people to have a breakfast while watching it :) The two minor comments: a) The street door lock might need some getting used to. b) remember there might be mosquitoes so buy the repellent in the next shop. On overall -- If we would come to Mallorca next time, we would stay in the same place. We arrived late at night and everything went smoothly. On entering the villa there was a musty smell which got progressively worse when you went downstairs. We wondered if it was because it may have been unoccupied the week before us. It did gradually go but was horrendous in the dressing room for the bedroom on the ground floor, so we didn&rsquo;t use this to hang up our clothes. Apart from this and the villa needing updating in both the bathroom and kitchen, the villa was okay. It was very spacious for the 4 of us and the pool was a lovely treat. I felt the villa lacked some attention; the entrance was pretty run down and not very inviting and the pool area could have been a bit prettier (like next door) in the gardens etc. The BBQ was nice to have as we did cook for 2 nights. The WiFi worked very well. The towels were changed mid week which I didn&rsquo;t realise as I washed them the night before! Was a nice position, about a 10 minute walk from the beach but a good 20 minutes to the main harbour in town. This was fine for us but was advertised being 1km from centre. Was a nice quiet area with a bus stop nearby and the main Eroski supermarket was about 15/20 minute walk away. We didn&rsquo;t have a car but in hindsight wish we did, if only for the food shopping. There was nothing on arrival in the apartment, only some washing up liquid and a 1 1/2 toilet rolls . Would have been nice to have had something as a little treat on arrival, especially as we didn&rsquo;t arrive until very early morning. with some tlc I think this villa would be very nice, just needs updating and tidying in areas. We had a lovely stay in Pollensa and love the resort, which we have been to a few times already.